On October 30, 1938 a young actor/director named Orson Welles took to the radio, a relatively new medium at the time, for a dramatic adaptation of H.G. Wells’ sci-fi Martian invasion novel The War of the Worlds. The radio play, staged as a series of mock news bulletins, incited mass panic as people mistook the fake newscasts for the real thing, believing an actual Martian invasion was occurring. It’s a good thing times have changed and people today are no longer so gullible and uncritical. Well, okay, there were those fake images of Hurricane Sandy that flooded social media platforms this past week and the not-infrequent celebrity death hoaxes on Twitter. Maybe not much has really changed since the infamous broadcast. 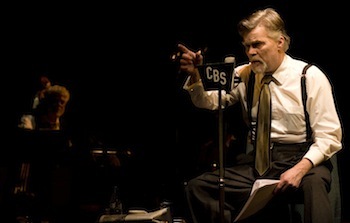 Welles’ broadcast was Art of Time Ensemble artistic director Andrew Burashko’s inspiration for a live-staging where the ensemble’s musicians would re-create the musical score of the broadcast. However, as Burashko explained before the show, after he acquired the original script and recordings of the broadcast he realized how little music there actually is in the radio play and what little score that does exist is constantly interrupted throughout the broadcast. To solve the music shortage the ensemble commissioned composer Dan Parr to arrange a suite of Bernard Hermann’s music. Hermann, a frequent Welles collaborator and musical director for the War of the Worlds broadcast, is a prolific film composer who scored iconic films like Citizen Kane, North by Northwest, Fahrenheit 451, Psycho, and Cape Fear. The opening performance of the evening, titled Hermannthology, features the Art of Time Ensemble performing the suite while a montage of film clips projects on a screen above the musicians with layers of video effects live-mixed by Tess Girard. The visuals augment the music without being distracting and the performance sets the tone for the evening. It’s the appetizer and during intermission, the stage is set for the main course; The War of the Worlds. For the second half of the evening, the performance space is transformed into a radio studio, a set of risers with microphones sit to one side of the stage opposite a table filled with elaborate props. The musicians sit at the back of the stage and the actors mill about the set, chatting, joking and smoking as an off-stage producer counts down the time, “Five minutes to broadcast”. Moments before the “On Air” light flips on, Orson Welles (Sean Cullen) enters with a confident swagger that borders on cockiness. We get the sense that he’ll be the ringleader for the proceedings. The performance that follows is magical. Cullen and fellow actors Nicholas Campbell and Marc Bendavid have a remarkable ability to channel a host of unique characters through their voices alone as they re-create the original radio broadcast from the script. Accompanying the actors is John Gzowski a foley (sound effects) artist. Throughout the performance Gzowski crumples cellophane to emulate the sound of static, uses electric fans to mimic the drone of air plane engines and bangs on sheets of metal to re-create the sounds of artillery fire. It’s a fascinating process to watch. What surprised me most about the play is that, despite its age, it’s actually a compelling drama. The performers use the script to paint vivid pictures in words allowing listeners to form the images in their heads. The added layer of watching the “behind the scenes” action of the radio play only increased my appreciation for it. In this case, seeing how the sausage was made actually enticed me more. I applaud Art of Time Ensemble’s efforts to make classical/instrumental music more accessible to a contemporary audience by blending it with other art forms. The War of the Worlds is as fascinating as it is entertaining; an experience not to be missed. Shows run Tuesday – Saturday at 8p.m., Wednesday at 1p.m., and Saturday and Sunday at 2p.m. Tickets from $25 to $59 are available online at harbourfrontcentre.com, by phone at 416.973.4000 or in-person at the box office.